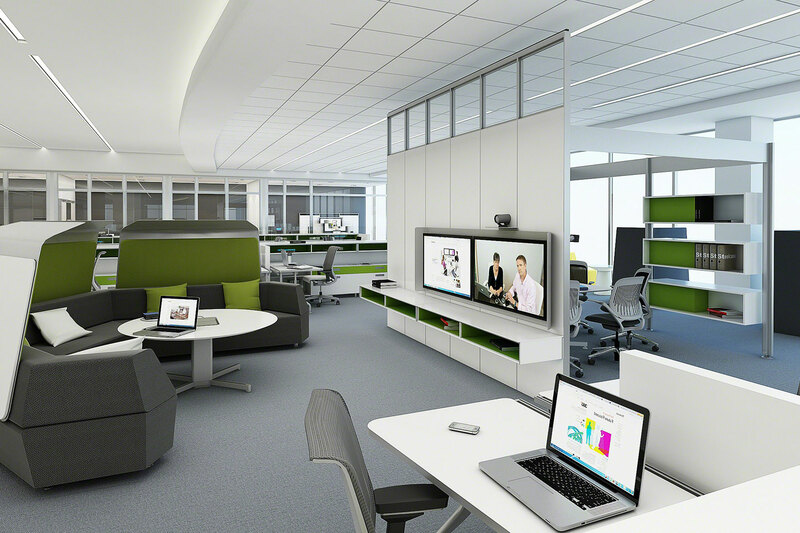 Business growth is certainly a good thing, but it can take a toll on your office space design. As your company takes on more work and brings in greater profit, you may need additional staff, equipment and supplies to meet the needs of your clients or customers. Your expanding business may also warrant more client visits, requiring an updated, eye-catching lobby that takes away from your work space. Fortunately, there are many simple solutions you can apply to maximize space. With the help of Office Designs’ talented office space planner and suggestions such as the following, you can make the most of your office. An abundance of paperwork, desk supplies and other small items is one of the biggest culprits for making an office seem cramped and small. Encourage employees to keep their workstations as well as the shared spaces clean and clutter-free to make the office appear more spacious. Minimizing what sits atop visible surfaces requires the proper tools: storage cabinets. Items that are not used on a daily basis should be tucked away and out of sight. Office Designs offers a wide variety of storage solutions, from simple filing cabinets to multifunctional enclosures. For example, the BDI Cascadia Mobile File Cabinet is a movable solution with locking inline casters that fits snugly beneath a desk or can be used as a stand for a printer or other equipment. The BDI Cascadia Mobile File Cabinet fits nicely under a desk or can be used as a printer stand. Color has a great effect on one’s perception of space. With the help of an office space planner, you can select wall paint that helps make your office appear roomier. In general, very bright or dark walls will make a room feel enclosed and small. Neutral tones, such as a mild green or soft yellow, can make the walls seem less prominent and work to open the space up. Adding an accent wall can also make a room seem more expansive, as it adds dimension. The space above eye level often goes underutilized. However, incorporating vertically-designed office decor and furnishings can create the illusion of additional height. For instance, you might place vertical wall art at the front lobby to greet guests when they arrive, providing a unique first impression that accentuates the height of the office. Additionally, you can turn to tall storage solutions. Office Designs offers options such as the Blue Dot Totem Bookshelf and BDI Phase 5-Tier Shelf, which are vertically inclined units that add height while saving space. Flexibility is invaluable in a tight office. Select furnishings that can be easily moved to clear out space when necessary, such as if you need to open up a clearing for a special presentation or change up office clusters temporarily. Movable desks come with wheels that allow for fast and simple transformation of the workplace. 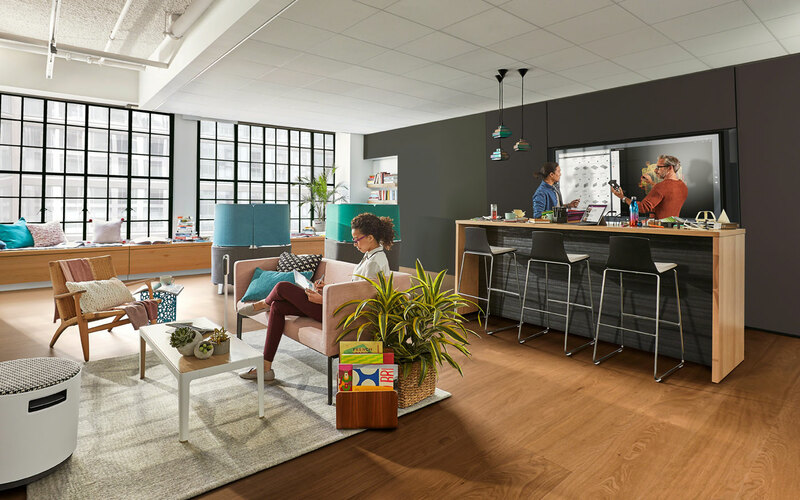 Office Designs offers multiple options, including the Herman Miller Everywhere Flip-Top Table and Office Star Ascend Pneumatic Height-Adjustable Desk. These can nicely complement other mobile solutions, such as moveable walls that can be folded and rotated to quickly transform an enclosed work area into a spacious conference room. Herman Miller Everywhere Flip-Top Tables come with casters for easy movability. These suggestions are just some of the many techniques that you can implement to enhance the appearance of an expansive office space and get the most out of the room you have. Office Designs’ experienced space planner is ready to help you revamp your office to cater to the needs of your growing business.